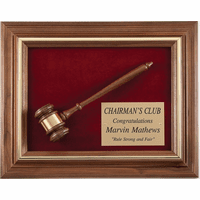 FEATURES/SPECS The gavel has a long recorded history throughout the world as a symbol of leadership and order. We commonly think of judges when we think about the gavel, yet there are many places where they are used. Wherever there are meetings, we are sure to find a chairperson who has the honor of keeping harmony and order, and allowing all viewpoints to be heard. 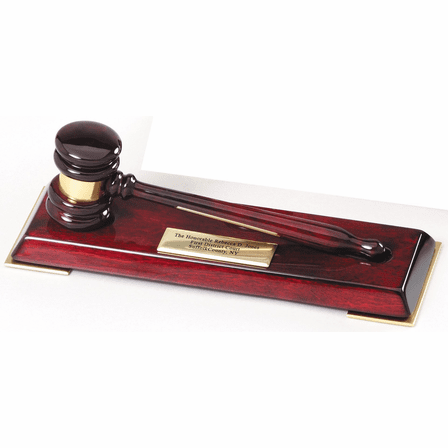 Our ladies gavel is sized at 8''', especially for women. The gavel and stand are gleaming piano-finish rosewood that will be a fine accent on the desktop or meeting table. A gold band around the center of the gavel head matches the gold engravable plate on the rosewood stand. 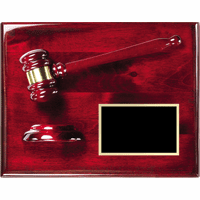 This is the perfect place for your name and title, or monogrammed initials, or even as an award gift for an incoming or outgoing chairperson for your organization or club. 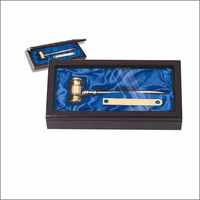 We will package the gavel and stand in an attractive gift box that'''s ready for your presentation ceremony, and it makes a good storage box for travel, too! 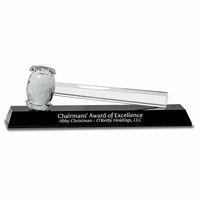 At the Executive Gift Shoppe, we are known for keeping harmony and order, so we are very happy to give you our full Satisfaction and Performance Guarantee! Ordered this to commemorate and honor the director of our theatrical production of A Time to Kill. The price was perfect the engraving room quite sufficient; the delivery prompt; the packaging lovely; and the product quite elegant.. It was hassle free and an overall great experience.